Family Fun #3: When Summer Gives You Lemons…. 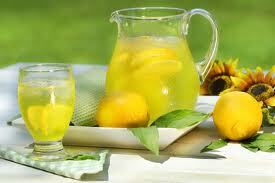 What says summer more than a pitcher of lemonade? Today’s Family Fun collection is a guest post from Kaylynn, whose blog A Teacher Without a Class is full of ideas for family activities that are educational and fun. I asked her for five lemon-y ideas that would support creativity. She gave me seven. Would I cut any of them? No way. Enjoy, and check out her blog for more family-friendly activities. Ask a question: Which lemon will give us the most juice? Form a hypothesis. Test the hypothesis by squeezing juice from the lemons. Think about what might make one lemon juicier than others. How could you pick out a juicy one at the store? 2. Create “An Angry Citrus” game. Collect all types of citrus fruits: lemons, oranges, grape fruit, and limes. Start rolling them on the floor. Notice the different characteristics of each fruit and their rolling strengths and weaknesses. Create obstacles for the citrus fruit to knock over, or roll around. Different fruits could be used for different levels. You could also design the cartoon characters for each citrus fruit. Of course, in this game there is no catapult or throwing of the fruit. You can see the origin of the Angry Citrus game at A Teacher Without a Class. 3. Read the book The Legend of Lightning Larry, by Aaron Shepherd. It is a wonderful book where Larry only drinks lemonade, and with his gun and accurate aim turns the outlaws good! All the names have wonderful alliteration: Sickening Sid and Crooked Curt. See who can come up with the most interesting alliterative name: Killer Kaylynn? Captivating Kaylynn? Or maybe, Horrible Harrison. 4. Or try one of my favorite activities for children: Put on a play. Aaron Shepherd’s website has a Lightening Larry script all ready to be used. Of course there are lots of opportunities for creative costumes, sets—and acting. My brother was a wonderful director—and we always put on plays every summer. We would charge our parents to see the play, and of course you could serve lemonade. 5. Have a contest to see who makes the best lemonade. Start wtih the basic ingredients: lemons, water, and sugar. Have the children taste-test until it has the right amount of sugar-water, lemon ratio. You can become really creative by adding cherries, raspberries, strawberries, limes, or even cinnamon. 6. Open a lemonade stand. Create a business plan. What type of lemonade are you going to sell? What kind of cups are we going to use? How much should we charge for each cup? When we will open the stand? Who will sell the lemonade? Or maybe, lemonade is too old-fashioned. Think of other drinks or products you could sell made from lemons. 7. Create a lemon print table cloth. Get a large sheet of white, butcher paper. Cut lemons in half and let the dry overnight. Paint in various shades of yellow. Work all together at creating the beautiful lemon table cloth. What other lemon-y ideas make your summer creative fun? « What Lives Around You?